Couching is a very simple hand embroidery technique. It involves two threads: a laid thread (this is the thread that is being couched onto the fabric) and a working thread (this is the thread that holds the laid thread onto the fabric). The simple couching stitch involves a small straight stitch taken over the laid thread. 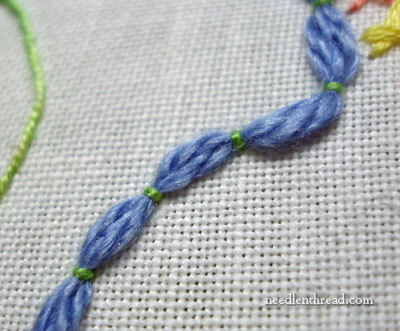 In the photo above, a couple strands of blue wool thread are couched onto the fabric using one strand of green perle cotton. 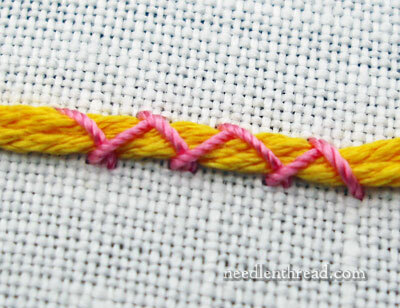 The couching stitch is very simple, and it can be used in all kinds of embroidery, from simple surface embroidery to complex goldwork techniques. In the photo above, the background is covered with a tiny gold thread couched onto the fabric in a technique called “vermicelli.” You can find plenty of tips and information on how to work vermicelli in gold in this article. 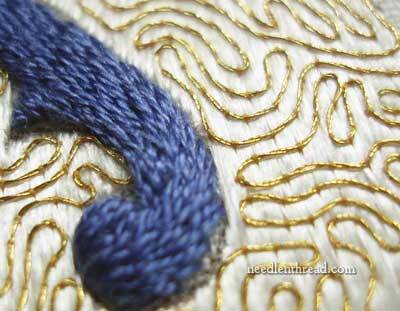 Couching is often used in goldwork. Above, you can see double lines of gold thread couched down over felt padding to fill an area. If you’d like to read a little more about this type of goldwork, you’re welcome to read through all the step-by-step articles for the goldwork pomegranate project . You can also couch threads using a variety of stitches. To read more about this, please visit my Stitch Play article on couching threads using other stitches. If you’d like to learn some other hand embroidery stitches, feel free to check out my collection of how-to embroidery videos here on Needle ‘n Thread! THANKS! I am really glad you did this video. It is better to SEE how to do stitches than read how-to in a book. This type of stitching is new to me and will of great help to others I’m sure. That was fabulous…I can see how this would answer all those questions about a stich, you just don’t get by looking at a picture..thanks for doing this. Eve and Sheila – glad the stitch videos are helpful! Thank you for these videos. Do you have any helps for people who are left handed. Most everything is for right handed. For left handers, you would have to do everything in the stitch “backwards” – although, with this stitch, you can work it the same exact way, but you’d be holding your working thread with your left hand. For stitches like the stem stitch, instead of working left to right, work right to left, and keep your working thread above your needle instead of below it. Hope that helps! Thank you very much for the videos. They are very helpful.Since I ‘m a slow learner, how to do in books was not that helpful. This videos helped me with the stitches i wanted to do. Thank you again. the only problem i have is that this, and the last, video do not have audio. wow this is a great work and I am really interested in it. In the same way I tried it myself and I found this video my first teacher and now I am doing it on my own clothings. thank you . Also i want tell that this video and the instructions on this site make me go into the work.so no wonder i will visit this site each time I access to internet. Keep up the wonderful work and please keep on adding new things. thanks a lot. bye. Take a large eyed needle (that the couched thread will fit into) and plunge the threads to the back of the fabric. Then stitch them securely to the undersides of the couching stitches. these video tutorials are really great help for me.thank you very much. Thank you SOOOO much for the wonderful,wonderful videos! I feel like I can do any stitch!! I was wondering if you put cross stitching on video.Thanks again!! Are you going back into the same hole? It depends on how thick the laid thread is… for thicker threads, you don’t have to, just go down on the other side of the laid thread. For fine threads, if you go through the same hole, make sure you don’t pull the laid thread to the back of the fabric – then you’d be doing a whole different technique, called undersided couching…. this helped a lot for our assignment. but how about "filling" to do that,?or, does "filling" exist? This was just what I needed. I haven’t embroidered in years and just couldn’t get this stitch by reading the directions. Thank you!!! mary thanx a lot for putting videos of stiching. i’ve a doubt pls help z german knot stich z same as french knot or z it diffrent. waiting for ur reply. Fantastic lessons!! I ‘m so glad to find and learn with your videos. Thank you so much from France!!! Like you I just picked up again embroidering that I learned from my grandmother. I just wanted to let you know how much I enjoyed your web-site ! I am so excited will be going to the store soon ! 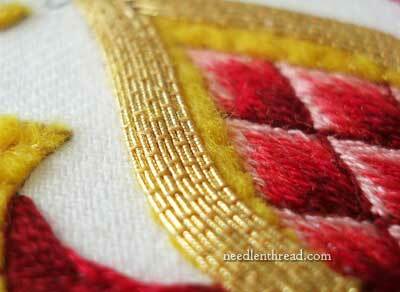 i am new in needle work.I even don’t know basic.. so kindly teach me how nd what to do first…?